The spring 2013 opening of this 12-story, 200,000-square-foot building coincided with the launch of a new medical school curriculum that incorporates team-based learning, individual problem-based learning and simulation. Designed by I.M. Pei’s internationally acclaimed architectural firm, Pei Cobb Freed & Partners, and Ballinger architects, the building houses classrooms, office space and simulation facilities. 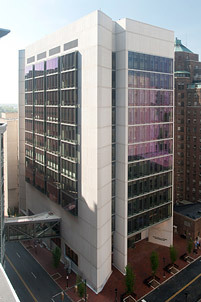 Two floors of the building are home to the Center for Human Simulation and Patient Safety, and another two floors are dedicated to cancer research.